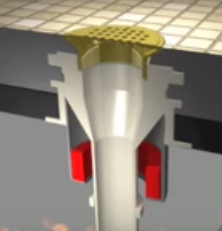 The T-Rite Drain patent pending device has an over-sized metal extension that attaches to a floor/shower drain base and extends down into the fire zone. The open area around the pipe allows the heat to quickly soften the plastic pipe (in 3 minutes) and accelerate the sealing from the Intumescent material (in 4 minutes). This unique feature seals the plastic pipe before any occurrence of flaming (in 5 minutes) and prevents temperature rise to the unexposed side. The entire metal extension device becomes tightly filled with a solid char (in 7 minutes). What do the terms F-rating and T-rating mean? Penetrations through floor or wall fire barriers must be protected by code with firestop systems that have an F & T rating in accordance with the ASTM E814 or UL 1479 Standards. The F-rating equals the number of fire test hours with no occurrence of flaming through the unexposed side. The T-rating equals the time any part on the unexposed side of the penetration reaches 325 above the initial temperature. This temperature can ignite cotton and could cause additional fire transmission without any flaming. When is the T-rating more important than the F-rating? Cyanide toxicity is drastically increased when PVC is burned. Smoke inhalation causes the most deaths in building fires. This smoke from burning PVC plastic pipe connecting a floor drain could fill a large habitable area in a few minutes. An open end floor drain penetration that has a certified 2 hour T-rating guarantees the firestop system will quickly seal off PVC pipe connections with no toxic smoke transmission.